The extraordinary reputation of Attila and his Huns requires an explanation, because they had so much competition. Their apogee, until Attila's death in 453, came just after the invasions that were extinguishing the Roman Empire in the west: the invasions of Germanic Alamanni, Burgundians, Ripuarian Franks, Salian Franks, Gepids, Greuthungi and Thervingi Goths, Heruli, Quadi, Rosomoni, Rugi, Sciri, Suevi, Taifali, and the original Vandals, as well as Alan horsemen of Iranic origin and probably Slavic Antae as well. Yet it is the Huns who are more vividly remembered than any of them, including Alaric's Goths, who in 410 had the historical distinction of being the first to sack Rome since the Gaulish raid of 387 B.C.E. (and to loot the accumulated wealth of centuries of empire); and more vividly remembered than the proverbial Vandals, who later inflicted greater damage by cutting off North Africa's grain supply to Italy. It was the same at the time. In the writings of their contemporaries, the Huns were singled out as the most dangerous of the barbarians, even before Attila rose to power to unify the Hun clans and harness more numerous Germanic camp-followers. Ecclesiastical writers identified the Huns with the ancient Massagetae and Ezekiel's Magog, and the Goths with his Gog, and trembled for the fate of the world. Secular writers rightly feared for the survival of the empire once Attila arrived on the scene. Even in the seventh, eighth, and ninth centuries, the comparatively illiterate ones, Attila's name keeps appearing in the scattered writings that have reached us: the Old English poem "Widsith" ("I visited Wulfhere and Wyrmhere ... when the Gothic army with their sharp swords had to defend their ancestral seat against Attila's host"); the Icelandic Old Norse poem "Lay of Hloth and AngantFDr," in which Attila is Hloth's grandfather; the Volsunga Saga, in which Attila is killed by Gudrun, who had been forced to marry him, a story derived from the older Atlakvida, "The Lay of Atli," or from the longer version in Atlamal hin groenlenzku, the "Greenland Ballad of Atli"--Attila's fame had reached even that most remote of places, Ultima Thule. The far better known Nibelungenlied retains a folk memory of Attila's massacre of the Burgundians of King Gundahar in 437: as Wagner fans know, the murdered Siegfried's vengeful wife Kriemhild marries Etzel/Attila king of the Huns, and bloody mayhem ensues. Ekkehard of St. Gall's Waltharius is far more fortunate: given as a hostage to Attila, Waltharius wins great renown as a warrior in his service, before fleeing with much gold from his court. All this created a huge problem for the greatest scholar who ever studied Attila and the Huns, the seriously multilingual Otto J. Maenchen-Helfen, on whom Christopher Kelly must still rely, and also for Edward Thompson, the author of the standard but now dated English-language work on the subject, The Huns, which appeared in 1948. The former was a sophisticated neo-Marxist and the latter a crudely Stalinist Marxist (at one point he rather hilariously attacks Roman magnates as class enemies), but both accepted the widely fashionable Marxist notion that individuals are ultimately insignificant as compared to historical processes. They adhered also to the theory of successive historical stages, according to which the later-stage "slave-owning empire" could have nothing to fear from earlier-stage "pastoral" Huns. Thompson, who first usefully deployed the Latin and Greek evidence--notably the writer Priskos of Panium, who spent much time at Attila's court--dealt with the problem by strenuously arguing that Attila was a small-time extortionist and bungler whose forces were largely destroyed in 451, when he attempted his only great offensive into what is now France, and was intercepted by the Roman-Visigothic coalition assembled by Aetius. (The latter is the leading contender for the role of "the last Roman.") Thompson did not explain how Attila was able to invade northern Italy in the following year with a formidable force. Even the infinitely more sophisticated Maenchen-Helfen--whose posthumous The World of the Huns exploited the extensive Russian-language literature on Central Asia and nomadism, as well as the extant archaeological evidence and his own ethnographic research in Tuva--compared Attila to the ephemeral Gothic warlord Theodoric Strabo, known as "the Squinter," who extorted two thousand pounds of gold from the eastern emperor Leo in 473. The facts are otherwise. The Huns were a mere herd of clans before Attila made himself their sole ruler, after killing his brother Bleda. Out of these clans he created a powerful if rudimentary state that sent and received envoys, and was organized enough to mount long-range expeditions. His father had been a chief, even a paramount chief perhaps, but it was by his own wits that Attila became much more than that--a charismatic king, or rex, the Roman title for a barbarian ruler of substance. Christopher Kelly's book is a semi-popular work, unlike his essential Ruling the Later Roman Empire. It includes at least one implausible story because it is too good to leave out--the marriage offer supposedly sent to Attila by the emperor's disgruntled sister Honoria--and it excludes at least one essential research advance, but Kelly's book is certainly not unscholarly and it does present more than enough evidence to show that Attila's talents mattered a great deal. He had the political ability to unify under his undisputed command not only the naturally fissiparous Huns (nomads must diverge to find pastures), but also a great many Goths, Gepids, Heruli, Alans and even dissident Romans. When Attila died, the Hun power quickly fell apart. Very active diplomatically--unlike modern barbarians, he respected diplomatic immunity--Attila was able to manage relations successfully with both the consolidating Constantinople branch of the empire and its disintegrating western branch. (The empire was still one; only its administration was divided. ) 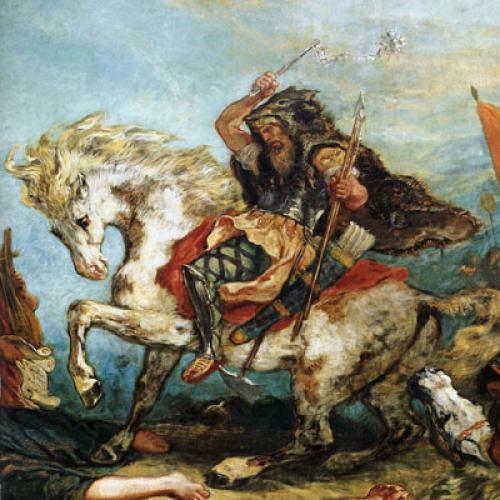 Above all, Attila had the strategic ability to magnify his power by combining military action with skillful diplomacy--he always found a legalistic justification for his demands. And to these talents he added terror, or the propaganda of the deed, as with the utter destruction of the great fortress-city of Aquileia at the northeastern passage into Italy, which gained him the surrender of rich Milan and many other cities. In our day, many historians do not have a problem with Attila or any other "Great Man of History." They accept the very personal role of Hitler, Stalin, Mao, and the rest in shaping history, "bottom-up" history notwithstanding; and so they can accept Attila's importance as a historical factor as their Marxist predecessors could not. But they have a terrific problem with the Huns, and the reason for this is simple. It is the nullification of military historiography in contemporary academia. "Strategy" exists in a few government or political science departments, but such "strategists" steer clear of military history. The academic consensus that all wars are pointless apparently extends also to the study of their history. There is almost no place, and almost no prestige, for anyone who wants to research and teach how and why battles and wars were won or lost--that is, military history strictly defined--as opposed to social history, economic history, and some forms of political history, including newly rehabilitated biographical approaches but excluding "kings and battles." Even research on "presidents and wars" is unwelcome unless there are cognitive or psychological pathologies to be studied. And there is the added impediment that military historiography is an arcane field, requiring serious archival research, often in languages other than English. While scholarly readers have an insatiable demand for military historiography, and students are very keenly interested in battles and wars, the faculties at our universities prefer to scant both. Appoint a military historian? The eminent Chicago Byzantinist Walter Emil Kaegi has explained why it almost never happens: tactics cannot matter, weapon techniques cannot matter, operational methods cannot matter, theater strategies cannot matter, because wars do not matter--as a subject of their own, rather than as epiphenomenal expressions of other causes and realities. Given the academic consensus that wars are almost entirely decided by social, economic, and political factors, there is simply no room for military history as such. That makes it impossible to explain why anyone would have been bothered by the arrival of the Huns. As steppe nomads with vast herds of horses, they were necessarily very few in number, as compared to agricultural populations; and they were less productive in every way, and thus very weak socially and economically. How, then, to explain their extraordinary prominence? Kelly goes beyond the conventional mode of analysis and bravely ventures into some of the military detail so as to provide the answer. It is that the Huns frightened everyone because they introduced a wholly new form of warfare. They fight from a distance with [arrows] ... then they gallop over the intervening spaces and fight hand to hand with swords ... and while the enemy are guarding against wounds from the sharp [sword] points, they throw strips of cloth plaited into nooses [lariats] over their opponents and so entangle them that they fetter their limbs and take from them the power of riding or walking. The first alarming novelty was that Hun arrows could kill at unprecedented ranges, because they were launched by the tendon-and-bone composite reflex bows that they introduced--the most powerful personal weapons of antiquity, far more lethal that the familiar reflex wooden bows ridiculed by Homer's spearmen. The second alarming novelty was that the Huns were trained from childhood as mounted archers. Like the Ogasawara and Takeda virtuosos one may still admire in Japan, they could hit targets even at a full gallop, even with sideways shots, and could turn for rearward shots. Hence they could stay out of range while they kept launching arrows into enemy ranks, before riding in for the kill with their swords and lariats. Beckwith's many quirky personal asides about this and that do not detract from the formidable scholarship with which he surveys the nations and states that waxed and waned in what is perhaps best called Inner Asia from the earliest times to the present. But this is no mere survey. Beckwith systematically demolishes the almost universal presumption that the peoples and powers of Inner Asia were typically predatory raiders, and thus supplied themselves by extracting loot and tribute from more settled populations. He demonstrates that it is much more accurate to view them as traders and the protectors of traders. Indeed, they were the quintessential traders of the Silk Road, alongside a few competitors from Europe and the Middle East. (The Han Chinese stayed at home.) The geographic boundaries of Inner Asia, or Central Eurasia as Beckwith prefers to call it, and thus the boundaries of his work, are not fixed over time because the size and reach of Inner Asian powers varied greatly--the Mongols, most famously, were once simultaneously present in what is now Poland, Syria, and China. The space allowed to Inner Asian powers began to shrink from the seventeenth century because of the eastward expansion of Russian military settlers, the Cossacks of Siberia, and the westward expansion of the Ching dynasty. It was the Ching rulers--themselves alien northern conquerors who long retained their distinct "Manchu" identity and Tungusic language--who endowed China with the greater part of its present territory, by conquering what is now the huge province of Xinjiang, once known as Turkestan, and the largest parts of two other provinces, Qinghai and Inner Mongolia. The Ching also imposed something of a protectorate over Tibet. In expanding all the way east to the Pacific Ocean, the Russians mostly remained beyond the northern limits of Inner Asian powers, but eventually they did reach the Mongolian territories, which they still retain. The convergent expansion of Russians on one side and the Ching dynasty on the other extinguished states and fragmented peoples. Today there are the Mongols of the independent Republic of Mongolia, and many more Mongols in China's Inner Mongolia (though it has a large Han majority), and more Mongols in Xinjiang, and the Mongolic Buryats of the Russian Federation. The Tibetans, who once ruled an empire of their own, are now both ruled and fragmented, with populations of Tibetan culture from India's Ladakh to northern Nepal's Mustang, the northern part of Sikkim, the entire Kingdom of Bhutan, India's Arunachal Pradesh, the Tibetan Autonomous region of China, and the Tibetan parts of three other provinces. Beckwith ably explains how all this came about. With his work, there is finally a fitting counterpart to Peter B. Golden's magnificently comprehensive An Introduction to the History of the Turkic Peoples: Ethnogenesis and State Formation in Medieval and Early Modern Eurasia and the Middle East, based on Arabic, Hebrew, Persian, Greek, Latin, and European medieval sources. By reading just two books anyone can now sort out Charlemagne's Avar Ring, the Golden Horde, modern Kazakhs and Uzbeks, ancient Scyths, Borodin's Polovtsian dances (they were Cumans), present-day Turks, Seljuks, Ottomans, early Turks, and Bulghars and Bulgarians, among many less familiar states or nations. But not the Huns. They were long believed to be Xiongnu or Hsiung-nu defeated in China, and then believed to be anything but that. There was even a tenuous Iranic theory. But new evidence has now emerged in favor of Xiongnu origins, in the one important piece of research that Kelly has overlooked. It was presented in 2005 in an essay by Etienne de la Vassiere that exemplifies recent archaeological advances, of which there could be many more if archaeologists could operate more freely in the Stans, and if the Chinese would take a few pennies from mega-construction projects to fund proper critical editions of the dynastic histories, now available only as mere reproductions or at best as transcriptions of the ancient wood-block prints, essentially unedited and unpurged of transmission errors. Whatever their origins, the Huns could not have dealt the death blow to the Western branch of the Roman Empire--Kelly accepts that ancient thesis, as do I--by tactical superiority alone. Even the strongest tactics can be overcome at the higher operational level of strategy: that is how Rommel kept defeating stronger British forces until El Alamein. But the Huns had operational superiority as well, because they could almost always outmaneuver their enemy with their superior mobility. Just like today's Mongols, they rode better because they started early. In Mongolia's current Eriyn Gurvan Naadam races, the jockeys are children, with the minimum age being five, and they must control impetuous two-year-olds over sixteen kilometers, or seven-year-olds over thirty kilometers, and not on prepared courses but over open grassland. Yet there was more to the secret of Hun success. Roman, Gothic, and Alan cavalrymen might also have been sublime riders, but they had only their horse and a remount at best; and horses being much weaker than men, they cannot be worked hard for more than a few hours at a time. Every Hun, by contrast, rode with a dozen horses or more, distributing loads and jumping from one to the other, so they all remained fresh. For the same reason, Attila's forces enjoyed also superior strategic mobility. He could sit in his tent somewhere near Arad, Banat (in modern-day Romania) and decide whether to invade westward into Gaul or Italy or south toward Constantinople. The next European who could operate on that geographic scale was Napoleon Bonaparte. It took superiority at all three levels--tactical, operational, and strategic--to make Attila's unified Huns the "greater-than-expected" threat that finished off the western empire, and inspired the emergence of what became Byzantine strategy in the eastern empire, which thereby lasted another eight centuries by the shortest reckoning. Its essence was to use force not to obliterate enemies but only as a diplomatic tool, and always moderately, to contain dangerous neighbors rather than destroy them. The reason was not only that set-piece battles of annihilation have a high cost in casualties. The Byzantines also never forgot that today's enemy could be tomorrow's ally. The days are past when Christianity, poisoning by lead pipes, or any other cause could be invoked to explain the fall of one-half of the Roman Empire while disregarding the survival of the other half, though it was just as Christian or just as poisoned. Only the possibility that a military difference, a difference in strategy between east and west, might have determined the outcome has remained unexplored--until now. Edward Luttwak's new book, The Grand Strategy of the Byzantine Empire, will be published by Harvard University Press in the fall.